Cross River State is a coastal state in southeastern Nigeria, bordering Cameroon to the east. It is located in Nigeria's Delta Region. It is bounded on the North by Benue State, on the South by Akwa Ibom State, on the East by Cameroun Repulic and on the West by Anambra and Imo States. Its capital is at Calabar, and it is named after the Cross River, which passes through the state. Ibibio and Efik are major languages of this state. Cross River is the main river in the Cross River State of southeastern Nigeria. The Cross River drains into the Bight of Biafra in the extreme southeastern corner of Nigeria's coastline. The Cross River forms a boundary between two tropical moist forest ecoregions, the Cross-Niger transition forests which lie west of the river, between the Cross and Niger Rivers, and the Cross-Sanaga-Bioko coastal forests, which lie to the east between the Cross River and the Sanaga River of Cameroon. Cross River is named after state in Nigeria, where the Efiks belong. Cross River State was created on the 27th of May, 1967 from part of the former Eastern Region, and was known as the 'South-Eastern State until 1976 when it adopted its present name. The state originally included what is now Akwa Ibom State. The state is ethnically diverse, including Efiks, Bekwara, and Ejagham inhabitants. Efik is very widely spoken in Cross River State because it used to be a language of trade and commerce in the 19th and early 20th centuries. Other languages spoken are Ekoi, Etung, Boki and Becheve. The Becheve people have linguistic affinity with the Tiv of Benue State. The people's wood carving, stone sculpture, raffia and cane works, pottery and silver works are highly valued in and outside Nigeria. 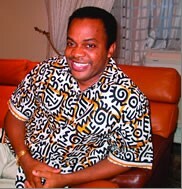 Since Nigeria went democratic in 1999, the governor has been Donald Duke, who won election again in 2003 for another four years tenure that will end in 2007. We will upgrade this page showing the next governor come 2007. The state has experienced tensions between ethnic groups as well as border clashes with other states, particularly Akwa Ibom. Most of the inhabitants of Cross River are Christian. The state government is striving to make Cross River the tourism hub of the West African coast via the Tinapa resort project. Cruise ships are eventually expected to bring in large number of tourists to enjoy the Tinapa business resort.